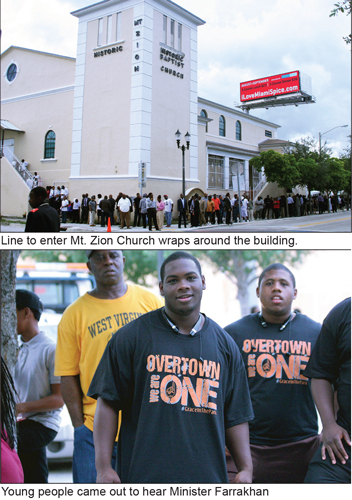 MIAMI - When the Honorable Minister Louis Farrakhan stepped before some 1,500 people packed into the historic Mt. Zion Baptist Church the crowd exploded with applause. What most in the crowd did not know what the 82-year-old leader had been infused with boundless energy during this trip South to promote the “Justice Or Else!” gathering planned for this fall in the Nation’s Capital. Over several days he met with leaders, youth, activists, artists and preachers and professionals in private sessions and group sessions, never tiring, never wavering, never-not-smiling. That same energy pervaded the church where extra chairs were added to a full upstairs sanctuary. Downstairs listeners endured a sweltering heat to hear sound piped in via speaker as event organizers were forced to find a place for people who had come out and refused to leave somewhere in the building. Then outside others gathered around loud speakers placed outside, sitting on street curbs, on cars in a park across the streets and seemingly anywhere close enough to hear a clarion call for justice. The message was well worth the heat, the lines wrapped around the corner and a bright sunny day that turned into a humid night. “How can we charge others with the crime of killing us without due process and lying about it when we are killing each other? And we won’t march on ourselves, nor will we even rise up to condemn ourselves for what we are doing to ourselves. And in the gangs when we kill we don’t talk, so nobody is arrested and charged with murder and brought to what is called justice,” said Min. Farrakhan getting quickly into the subject of justice and his demand for justice planned for Oct. 10 in Washington, D.C., as part of the Justice Or Else gathering on the 20th anniversary of the Million Man March. The gathering will be no frolic, no picnic, no folly, but a serious demand for justice placed before a government rife with injustice and a crisis in police killings of Blacks, Native Americans and others inside America. Such a demand called for an assessment of conditions and confronting White oppression on one side and Black fratricidal violence on the other. “And the police when they kill us, they put the lie out first and then back the lie up with the institutions of government of White Supremacy. And so even though we march and even though we fight against this injustice it continues unabated. So we have decided on the 20th anniversary of the Million Man March we want to go to Washington. “So what is the power that should back our righteous demand for justice? It is the unequaled power of our unity as a people. We have never ‘gone united.’ We stay as little tribes and factions, gathering only for the moment and then scattering after the moment. But when you and I can go as a people, not Muslim and Christian and Baptists, and Methodists, and Crips and Bloods, and native tribes, but go as the original inhabitants of our planet to demand justice and some of this earth we can call our own,” he said. underdeveloped and disrespected community without substantial reinvestment. Such social engineering leaves Uncle Sam ready to recruit fearless Black youth in the armed forces, and the U.S. government helped foment the crack cocaine epidemic by placing drugs and weapons in the ‘hood to promote fratricide and Black discord, he said. The wise of this nation, and leaders like J. Edgar Hoover, the longtime FBI director, know it is time for the rise of Black people and are determined to avert the destruction and fall of White supremacy, the Minister noted. But like a serpent, Whites are deceptive, trying to keep control of the once-slaves who are destined to go free by monitoring their activities, their leaders, their actions and even their social media posts to cull information, he said. 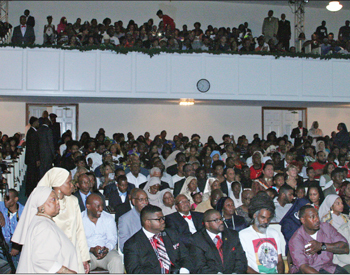 It was standing room only for a Thursday night message from Min Farrakhan in Miami. “They would like to charge us with radicalizing our people by telling the truth, but every time they kill a Black man or beat up a Black woman or unjustly stop us for traffic violation and then kill us, we are being radicalized. They are the ones who are radicalizing us. 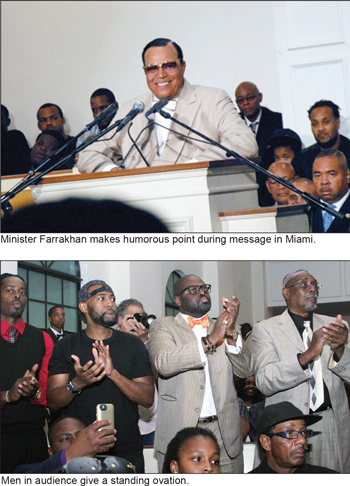 All we are doing is telling the truth of what they are doing,” Minister Farrakhan thundered as the crowd roared back and started to applaud loudly. Later in his message, the Minister called for 10,000 fearless men willing to make the ultimate sacrifice rather than live under tyranny. There comes a time in the life of every people who yearn for freedom where death is sweeter than to continue life under oppression, he said. Blacks must protect their lives if the federal government refuses to intervene when Black lives are unjustly and the principle of a life of a life is laid out in scripture, the Minister explained. “Death is sweeter than to continue to live and bury our children while White folks give the killers hamburgers. Death is sweeter than watching us slaughter each other to the joy of a 400-year-old enemy. Death is sweeter. The Qur’an teaches persecution is worse than slaughter then it says, retaliation is prescribed in matters of the slain. Retaliation is a prescription from God to calm the breasts of those whose children have been slain. If the federal government will not intercede in our affairs, then we must rise up and kill those who kill us, stalk them and let them feel the pain of death that we are feeling,” said Min. Farrakhan. The crowd rose to its feet and gave another standing ovation. The Minister again called for a boycott of Xmas holiday spending as a response to oppression and the disrespect of Black life. He cited the last public speech of Dr. Martin Luther King, Jr., in 1968 in Memphis, where the civil rights leader spoke of inflicting economic pain on those who have oppressed Black people. Dr. King was more than a dreamer, he was a freedom fighter who awoke to the American nightmare, the Minister said. The way to inflict economic pain is by withdrawing money from the forces of oppression and using our combined economic might create a reality for ourselves, said Min. Farrakhan. He urged the audience to reject pagan celebrations in the name of Jesus and to spend time with loved ones, not exchanging gifts, but heartfelt discussions about the reality of the man Jesus and his life’s work, the Minister said. Men, women and children of different backgrounds filled Mt. Zion. Although doors were supposed to open at 6 p.m., the church was already halfway full by then. The line extended down the sidewalk and around the building as men and women entered through separate entrances, but sat side by side in the historic house of worship. By 6:30 p.m., the church sanctuary was full and people had to begin filling a steamy overflow room. 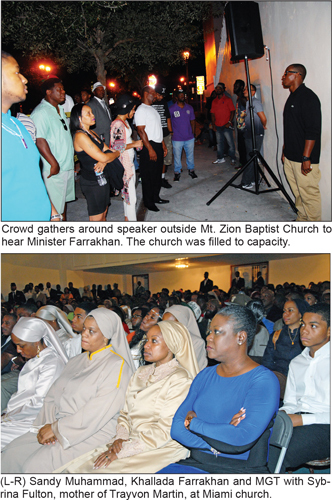 Though all came to hear Minister Farrakhan, everyone had different reasons or paths that ended July 30 for the Thursday evening message. Some had a direct connection to the Nation of Islam. Donna Addy, who is originally from Detroit, but now lives in Boynton Beach, Fla., grew up in the Nation of Islam. However, she didn’t continue to attend mosque meetings throughout her life. Over the past few months, she’s been making the hour long drive from Boynton Beach to Miami to attend the Sunday meetings at Muhammad Mosque No. 29. Asha Starks, a 22-year-old attending Barry University in Miami, felt since she was part of the student movement, she should hear different viewpoints. Her grandfather aided Minister Louis Farrakhan during the Million Man March in 1995, which helped to shape her stance on social rights today. “We need organization. There’s a lot of messed up stuff, and if we just stand by, nothing can change,” Ms. Starks said. 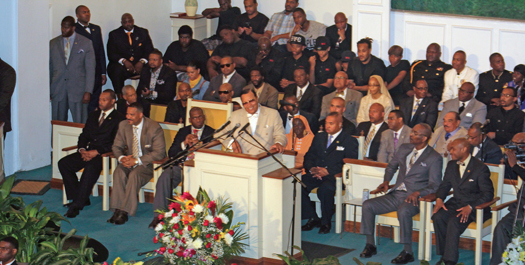 One of Minister Farrakhan’s main messages during his Justice Or Else tour across the country has been unity. Many say unity is needed in the community. Minister Farrakhan has not only been pushing for unity among Blacks, but unity among Native Americans, Hispanics and others who have suffered injustice. Wayne “Smoke” Snellgrove, a native of Saskatewan, Canada, was a guest of Minister Farrakhan during a leadership meeting for indigenous people and Latinos days before his speech at Mt. Zion Baptist Church. Mr. Snellgrove works for Indian Voices newspaper, which promotes education and public awareness about Native Americans and their issues. He loved what the Minister had to say and wanted more, so he found himself at the church. “I hope to gain motivation to keep fighting for the cause because it gets tiresome,” she said. “You just need to be in the company of other like minds,” said Vanessa Gonzalez, a 31-year-old Latina. Both Mr. Snellgrove and Ms. Gonzalez say it is time to unite. “I think 10.10.15 is a great way to be with my brothers and sisters,” Mr. Snellgrove said. Once Minister Farrakhan mounted the podium after a deafening round of applause, many got what they came for. Minister Farrakhan not only touched on unity in the community, but he also spoke about unity between the nature of man and the nature of woman. 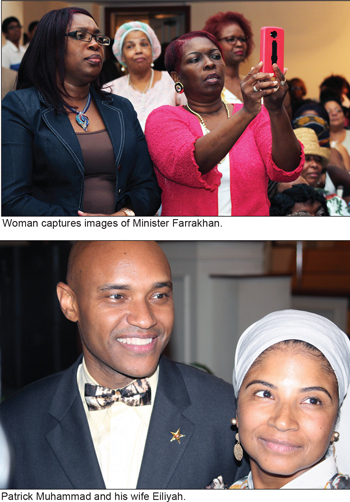 For a portion of his lecture, Minister Farrakhan focused on the woman and how she should be treated. Minister Farrakhan provided all listeners with an empowering and motivating message, letting them know that they have the power within themselves to do great things. The Minister also enlightened many on what being a believer in Jesus Christ really means and dealt with the need for justice. In his last public speech, Dr. King talked on the need for land, the need to spread economic pain to those who practice injustice and supporting Black banks and institutions, the Minister observed. Listeners shot to their feet many times to applaud the Minister’s unique message. After closing out in prayer, several guests left the church talking about what they had heard. 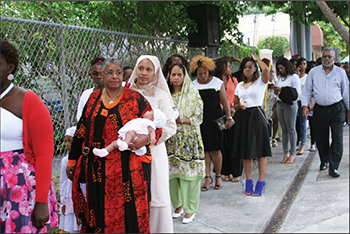 Others crowded around the church on the sidewalk and across the street, buying DVDs and books of the Nation of Islam and asking when they could attend the mosque in Miami. Minister Farrakhan gave listeners many things to think about when it came to improving their lives and the state of their communities. After hearing Minister Farrakhan’s lecture, Britney Stephens left with a better idea of who he is and what he’s about. Twenty-seven-year-old Shameka Thomas felt the Minister’s lecture was powerful and intense. After hearing his message, many people was excited to be in Washington, D.C. on 10-10-15. Arleen White, an activist originally from Jamaica who lost her 14-year-old son to gun violence, felt Justice Or Else is long overdue. 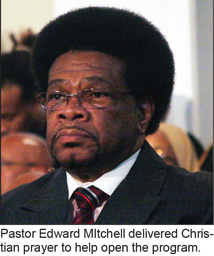 For Michael Lowe, it was just nice to see Minister Farrakhan in person.